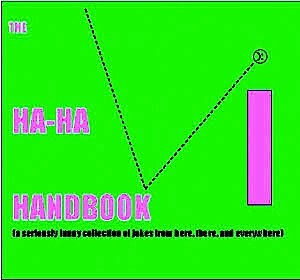 Carefully compiled by Bernhard Trenkle, a man with a particularly good memory for certain kinds of things, The Ha-Ha Handbook is an essential addition to any serious library. There are jokes that will make you laugh out loud at the most inappropriate times. Others you won’t even want to admit you think are funny. And some, well, we know that humor, like beauty, is in the eyes of the beholder, and we have perforated the pages so you will be able to throw out those that really offend you … or better yet, so you can pass them on. In other words, you truly get the last laugh in editing the book. By the way, there have been impressive outcome studies to support your purchase of this book. Bernhard tells us that the jokes have been extensively tested by psychotherapists (and dentists) around the world. Of course, we thought that, in and of itself, was pretty funny!